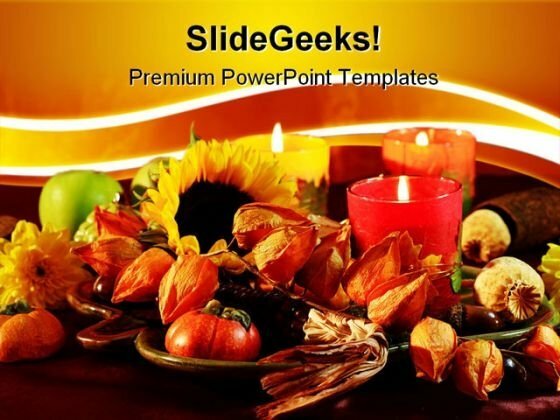 Thanksgiving PowerPoint templates, backgrounds Presentation slides, PPT Themes and Graphics. Wish your friends and loved ones a Happy Thanksgiving with a presentation greeting using our wide collection of Thanksgiving PowerPoint Themes and slide backgrounds. Our thanksgiving themes are ideal to present the Thanksgiving prayer at Church service. The beautiful graphics for each theme such as the pumpkin pie and the bounty of the harvest depict the many facets of this religious festival. Our Thanksgiving themes are not just a visual delight but feast for taste buds too, especially the ones showcasing the delicacies of Thanksgiving dinner such as the turkey, potato with gravy, vegetables, etc. 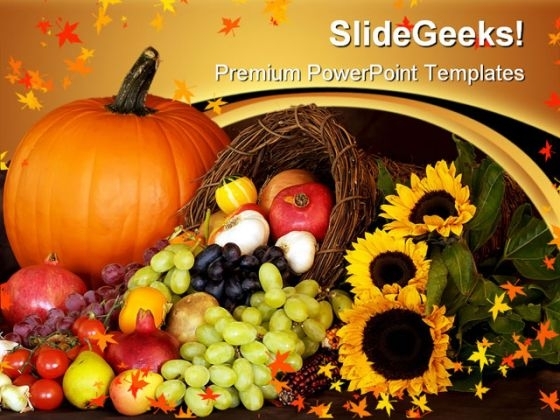 So give the festive touch to your PowerPoint presentation using our royalty-free Thanksgiving themes. "Microsoft PowerPoint Template and Background with still life of fall holiday setting of fruits veggies candle pumpkin wheat" Press fast forward with our Thanks Giving Season Festival PowerPoint Templates And PowerPoint Backgrounds 0411. Give your career a booster dose. Provide insights with our Thanks Giving Season Festival PowerPoint Templates And PowerPoint Backgrounds 0411. Download without worries with our money back guaranteee. 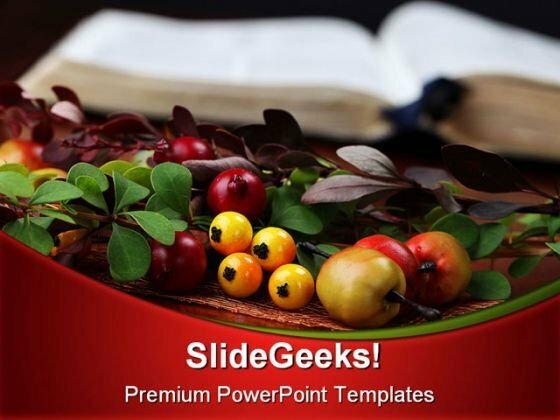 "Microsoft PowerPoint Template and Background with autumn arrangement and the Bible in background shallow dof" Perfect your presentations with our Bible And Thanksgiving Religion PowerPoint Backgrounds And Templates 0111. Download without worries with our money back guaranteee. Author great presentations with our Bible And Thanksgiving Religion PowerPoint Backgrounds And Templates 0111. Download without worries with our money back guaranteee.